Western State University College of Law Legal Ethics Panel. Panelist with Justice Edward Wallin (Ret. ), John Montevideo, Esq., Hon. Ellen Peck (Ret.) 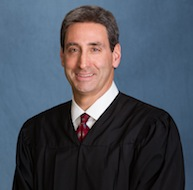 State Bar Court Judge and Professor Kevin Mohr. Constitutional Rights Foundation "Law Firm of the Year" Weinberg & Weinberg, given to individual attorneys in the firm. Western State University College of Law-Hall of Fame-Inducted May 21, 2000. Private Judge - Private Dispute Resolution Services.